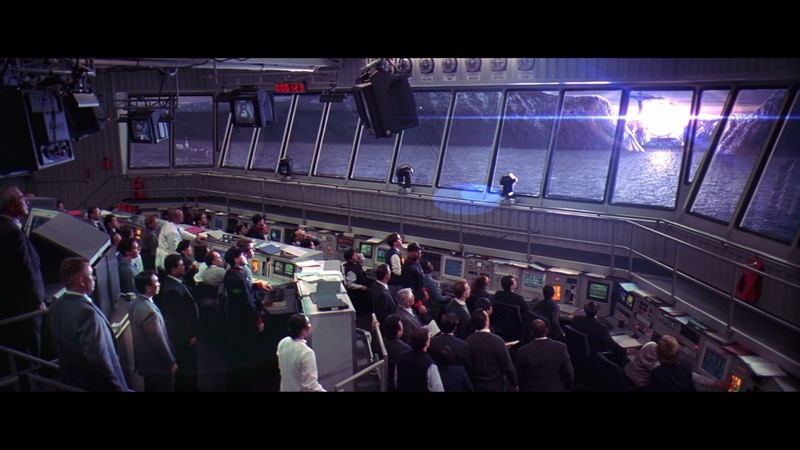 The film starts with a close shot of the earth from space accompanied by audio broadcasts spanning twentieth century events. There are numerous bits of music and headline stories, including the assassinations of John and Robert Kennedy, for example. The camera pulls back through the universe and the sound becomes less distinguishable until it is totally lost. The shot ends with a close-up of Jena Malone’s eye, the actress playing the young Ellie Arroway. The ocular globe’s contents mirror the shapes of stars and other stuff that make up the celestial contents of outer space. 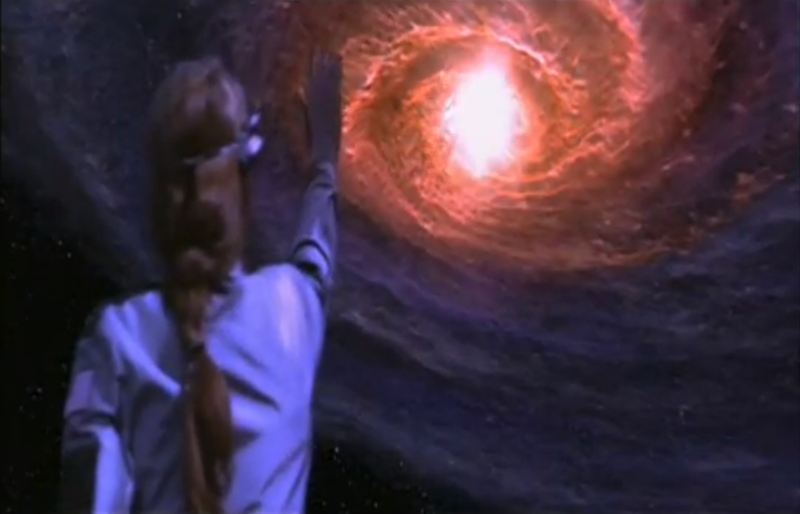 In this opening sequence we see that the infinite is experienced by a finite, mortal individual, and, thus, how the two are intrinsically intertwined. The beginning also hints at the later explanation in the plot of how aliens heard our radio signals and then responded to them. Young Ellie never knew her mother, who we discover died during childbirth. It is one of the events that makes her different and cut off from others. 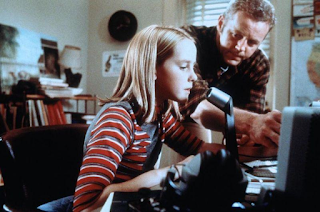 She was a science and mathematics prodigy (another fact that sets her apart), and her father, Ted (David Morse) encouraged her in academic pursuits, providing her with a shortwave radio and telescope. These instruments help one to escape being alone by connecting with other people and heavenly bodies. Indeed, we see Ellie talking, in Madison Wisconsin, with someone through her microphone who lives one thousand miles away in Pensacola Florida, a new distance record for her. It is interesting to note that in the bedroom of someone whose entire life will be steeped in science, she has a painting of a unicorn on her wall, a magical creature that some wished really existed. She demonstrates her desire to break the boundaries of science when she asks her father if they could talk to her deceased mother. This question also shows how her life will be dedicated to pushing the limits of science to escape the restrictions imposed by being a circumscribed human confined to the earthly realm. As Zemeckis did in his Back to the Future movies, he plants words and images that will be revisited later, adding resonance to the story. The reference to Pensacola, Ellie’s dad telling her she must make “small moves” to tune in other radio operators, and his statement that if there is no one else living in the universe then it “would be an awful waste of space,” show up later. After her father’s fatal heart attack when she was nine years old, Ellie is even more isolated. It is difficult for an extremely intelligent, science inclined child to be comforted by religious explanations after losing both parents. After her father’s funeral, the local clergyman tells Ellie that we are not always meant to know the reasons why things happen, and must accept God’s will. Her response is one that denies a grand plan forged by a deity, saying she could have saved her father if she had his medication on the downstairs floor. To not search for answers would deny the basic human desire to want answers. But, conversely, later, we see Ellie again trying to use science to achieve a supernatural goal, as she tries to reach her dad on her shortwave radio. 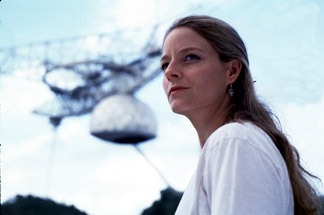 As an adult, Ellie (Jodie Foster) is working at a huge satellite antenna site in Puerto Rico, still trying to communicate with the great beyond as a SETI (Search for Extraterrestrial Intelligence) scientist. 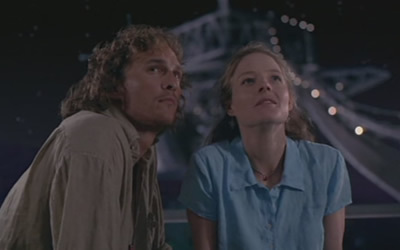 She is there with another astronomer, Kent Clark (William Fichtner), who is blind, but has, in a cliche narrative device, overcompensated with the loss of the visual sense with amazing auditory abilities (maybe why his name is the reversal of Clark Kent). The main point here is that he knows how to listen to the sounds of the universe, and admires Ellie’s dedication to doing the same. The thrust here is that one learns by hearing, gathering data, being empirical, not forcing the facts to justify a preconceived notion. 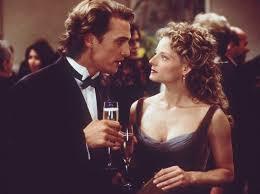 Ellie encounters Palmer Joss (Matthew McConaughey) at a local restaurant. There is immediate sexual chemistry between them. He carries a notebook around with him (he seems to carry a book with him most of the time, like a preacher holding a bible). He knows what SETI is, which impresses Ellie, and says he is writing a book about the effect of technology on third world peoples. He wants to meet David Drumlin (Tom Skerritt), who is sort of Ellie’s boss because he handles government spending on scientific projects. Palmer pulls a toy compass out of a Cracker Jack box, and gives it to Ellie, who returns it to him, saying how it might save his life some day. This compass shows up several times in the film. Ellie’s last name is Arroway, which implies she wants to aim her intellectual sights on a path in the sky that will allow her to hit her extraterrestrial target. The compass is a directional indicator. It is possible that Palmer’s attempt at giving her the compass is to help guide her in the right spiritual as well as physical direction. She declines a romantic attempt made by Palmer. Although she wants to connect with others to lessen her loneliness, the sting of losing both parents probably causes her to be cautious of close relationships out of a fear of being hurt if that intimacy is lost. Drumlin, unhappily visiting Puerto Rico, actually doing scientific research instead of working as a bureaucrat, considers attempting to contact alien life to be a waste of taxpayer money, and professional suicide for Ellie. At a reception, Ellie encounters Palmer again, and he questions Drumlin’s advocating that science should be practical and maybe profitable. Palmer says that’s okay, as long as it isn’t at the expense of the pursuit of truth, which is what the term “science” is all about. Drumlin, who has heard of Palmer, says it is ironic that the anti-science theologian is arguing for funding pure scientific research. Palmer says that he is not against science, as long as it is not “deified at the expense of human truth,” which he sees as something the soul needs beyond physical truths. Ellie now realizes the man she finds attractive is religious. He has a Master of Divinity degree, but dropped out of the seminary because he couldn’t handle celibacy. His line is one can call him “a man of the cloth without the cloth.” He tells Ellie that he did secular humanitarian work coordinating with third world countries to help out the people living in those nations. So, he is a person who wants to help people physically and spiritually. They leave the party, and Ellie points out astronomical formations in the sky. She says she became hooked on her field of study when she learned as a child that Venus, appearing shiny and beautiful, actually contained poisonous gasses and sulfuric acid rain. She says she was hooked after acquiring this knowledge. This admission points to Ellie’s desire to not be placated by deceptive appearances, and wanting to delve deep to discover truth. During their conversation, Ellie tells Palmar about all the mathematical possibilities that indicate that there should be life on other planets. He then echoes her father’s statement that if not, it would be an “awful waste of space.” Hearing her dad’s words again, she turns lovingly to Palmer, and significantly says, “Amen.” The two go to Ellie’s place and make love, (“knowing” each other in the mental and carnal biblical sense?) showing how the spiritual and scientific worlds can, at least for the moment, coexist. Palmer tells her that he had a religious revelation, an epiphany that was beyond intellectual explanation. He felt God was revealed to him. Interestingly, he says that he no longer felt “alone,” which again emphasizes the theme of wanting to be part of something greater than oneself. She says that she was thrown out of Sunday school because she would ask vexing questions, like “Where did Mrs. Cain come from.” She was not placated with unsatisfying answers. She applied, even as a child, scientific standards to the allegory and symbolism of religious texts which do not hold up to literal scrutiny, but still sustain many people in other ways. Palmer sees a picture of her father on a shelf, and asks about Ellie’s parents. After finding out about losing both at such an early age, he repeats the keynote line about how awful it must have been being all “alone.” Palmer wants to see her again, but she says she will be busy with work. She tells him to leave his phone number. But, when she leaves him, she looks lost, again seeking direction, wanting to be close to someone, unsure about investing herself romantically with someone who thinks so differently, and maybe afraid of making herself emotionally vulnerable to loss. Kent tells her that Drumlin pulled their funding. They decide to raise money from the private sector to rent time at the antenna array in New Mexico. She tells one of her colleagues to get some Hollywood cash, because filmmakers have been making money off of aliens for years (an obvious inside joke here). As she packs up to leave, she sees the phone number Palmer left, but leaves it behind. He also left her the compass, which she takes, and wears around her neck, a kind of symbol of her need for an old school GPS tool to help her on her scientific quest, which mirrors Palmer’s spiritual one, to find truth, and become part of something grander. 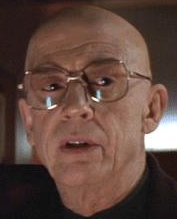 Ellie eventually winds up at the corporate headquarters of industrialist S. R. Hadden (John Hurt), whose name, according to IMDb, comes from an ancient Assyrian king by the name of Esarhaddon, indicating, possibly, pagan power? She pitches for money to fund the New Mexico project. The executives there tell her proposal sounds less like science, and more like “science fiction.” She counters by saying the airplane, breaking the sound barrier, and landing on the moon were once thought of as science fiction. She doesn't say make a “leap of faith,” but in essence that is what she implies when she urges them to pull back, take a look at the “bigger picture” involving the possibilities of scientific research, and adopt some “vision,” to see the positive results to be obtained in funding her project. She notices some surveillance cameras as one of the men there takes a phone call. He says she has her money. She looks up at the camera and mouths a thank you. In a way, her pitch was a prayer, and Hadden is a secular, god-like being, who has all-seeing eyes in the sky, is all-knowing about people’s lives, is very powerful, flies in the air all of the time, and hardly ever lowers himself to land on earth. If not a god, he is Ellie’s guardian angel, who comes to her rescue, or so it seems, several times. Fours years pass, and Ellie is at the array in New Mexico. Unfortunately, Kent tells her that her old nemesis, Drumlin, doesn’t want the government to rent them the telescope time anymore, considering that use of the array impractical. So, they have three months to vacate. 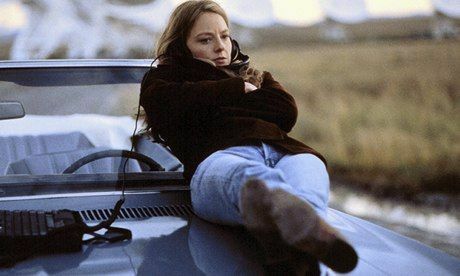 She sits on her car (a means of transporting you to get to where you want to be, which sums up Ellie’s past and future) at the edge of the Grand Canyon, a vast expanse of area that symbolizes the universe that Ellie wants to explore. 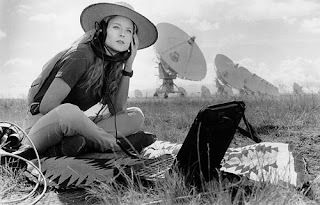 She is typically alone, listening to sounds from outer space, when she hears a modulated transmission. The camera zooms in on Ellie’s eyes, echoing the opening of the movie, emphasizing the connection between the individual and the infinite beyond. She excitedly calls the finding into the control room, and she and her fellow workers verify the transmission comes from the star Vega, which is about twenty-six light years away. The transmission alters, sending out bursts that signify prime numbers, which shows the sounds are not natural in origin, but sent by intelligent life, speaking in the universal language of mathematics. It is interesting that this event that turns science fiction, according to the Hadden executives, into science fact occurs close to Halloween, which is a holiday centered on the supernatural. 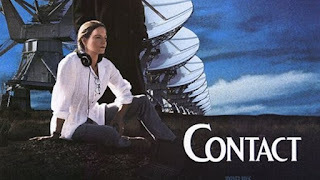 It is a bit ironic that while Ellie is reaching out, listening to the sky to join with something beyond herself, we see a TV interview in the control room with Palmer, who has become a best selling author, and a spiritual leader, saying that despite the internet, technology has not made us happier, and we feel more alone than ever. He talks about how we as a species have lost our sense of direction, which is exactly what Ellie has been trying to find, and which the compass symbolizes. 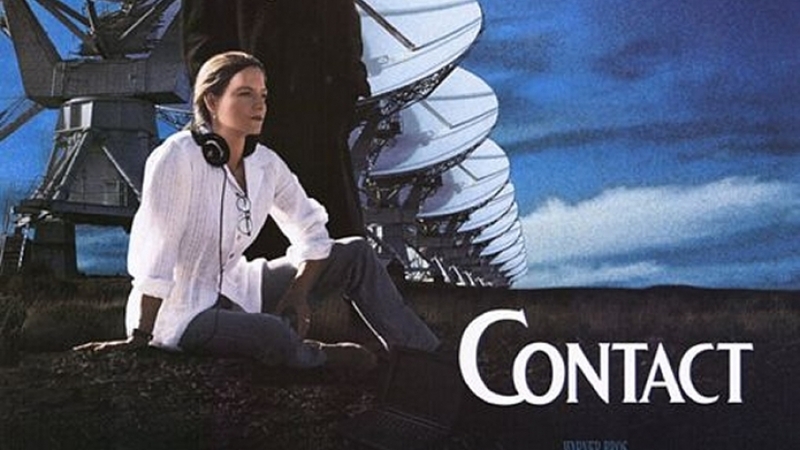 Ellie must communicate with other scientists around the world to verify the source of the signal. 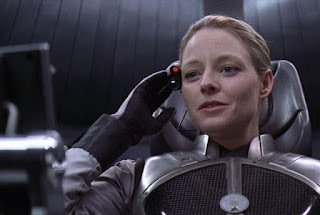 Not only is this act a practical plot action, it also shows, thematically, that Ellie is not only making contact with an alien civilization, but also connecting with the rest of the world, taking her out of her seclusion. But, her discovery and actions create conflict with narrow minded people and envious ones. Michael Kitz (James Woods) is a government security adviser who wants to classify Ellie’s work and militarize it. He represents those who have no vision beyond their egocentric selfish view of life, and become paranoid, believing that those that are different are a threat to their existence. He represents xenophobia. Drumlin, who doubted Ellie’s work, now wants to selfishly capitalize on it. He tries to take over the project, interrupting Ellie continually as he tries to commandeer the conversation. Kent, with his superhuman hearing, realizes that there are audio and visual components to the transmission. They view Adolph Hitler’s opening remarks at the 1936 Olympic Games. It just happens to be the first strong signal sent into space, but, some pervert the message, considering it a threat, while Neo-Nazis see it as a vindication of their beliefs. Throngs of people visit the New Mexico site to advocate their take on the discovery. Their response to this event is one that thwarts the coming together of a universal community. Added to this mix of self-centered people are those who see the transmission as only between God and people on earth. There is one evangelical religious fanatic (Jake Busey), who stares directly at Ellie as she drives by with anger in his eyes (as opposed to the desire for universality in Ellie’s). He shouts that God has spoken to us from the heavens, and we don’t want scientists, who produced the atomic bomb, and poisoned the air and waters, to talk with the deity. Although he is crazed, he makes a legitimate indictment against the negative accomplishments of science and technology, and seems to represent an extremist, violent version of what Palmer is saying. But, even rational politicians and journalists discuss how the signal has religious overtones, because human religious history has propagated a unique relationship between God and earth, and the possibility that there are others in the mix upsets the theological applecart. 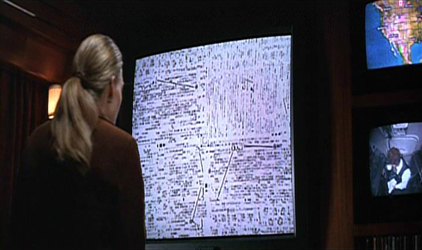 Kent also finds a tremendous amount of scientific and mathematical digital documents on the edges of the transmission, but they do not line up, and the scientists can’t uncover the primer to help translate the language of the messages. Here again is where the capitalist angelic presence of Hadden appears. He invites Ellie aboard his airplane, and shows how much he knows about her personal life. 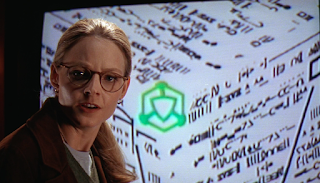 He hacked into the database that contained the alien documents. He says he wants her back in the game that Drumlin has taken over. He comments that he was once “one hell of an engineer.” He says an advanced culture thinks in multiple dimensions. He projects the data pages on a screen and shows how the pages are three dimensional cubes, and they line up when they are joined in that fashion. The translating primer is on the edge of each ‘page.” The decoding reveals schematics for a machine, which turns out to be a transporter. Of course, people, like Kitz, react with fear, believing it is a means to destroy us, and question the morality of the aliens, advocating, despite our history, that humans hold the ethical high ground. Palmer is now a spiritual adviser to the president. After being apart for over four years, he and Ellie meet at the White House discussion about the nature of the signal. He says that whether or not the transmission has religious significance, he does not see any reason to take an alarmist view. His words take on extra meaning as he smiles at Ellie, implying that they should try to find a way of finding common ground, which, of course, is the theme of the film. At a reception, Ellie and he discuss his book, and their differences again cause some conflict. She raises the concept of Occam’s razor, which states that, all things being equal, the simplest theory concerning a problem is the preferred answer. She asks which is simpler: that there is a supernatural being that created, and rules, the universe with no proof of his existence, or there is just the physical cosmos that we observe. She says that God may have been created by humans just to provide a feeling that people are not so small and alone (that word again). She says she would need proof of his existence. Palmer counters by asking her to prove the real love she had for her father exists, which of course she can’t, even though she knows it to be true. To be fair, this analogy is a false one. There is a difference between proving the physical existence of an actual, measurable phenomena, and a feeling, like love, which is not a concrete thing. However, suppose, one can argue, that God is not part of the material universe, but is other-worldly; then proof by scientific means will not work. The, religious experience, like the one Palmer says he experienced, is akin to Ellie’s feeling of love, and is then subjective, not objective. The problem comes when religions try to impose their dogma on others based on personal feelings, because religion is, by nature, absolutist in its beliefs. This way of thinking is illustrated by the religious fanatic who haunts Ellie in New Mexico and outside the scientific reception. The decision is made to build the machine. Palmer is on the committee to choose who should be the traveler. But, Drumlin wants to be the one to go, despite Ellie’s qualifications. Palmer hears warnings from scientists that this mission is an extremely dangerous one with a small chance that the explorer will be able to return to earth alive. Palmer meets with Ellie and asks her why would she give up her life for this quest. She significantly says that she has been searching her whole life for verifiable answers to questions that religion, for her, has not satisfactorily provided. She wants to know why are we here, what is our purpose, who we are. 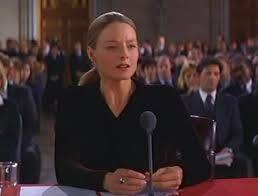 She holds up well at the candidate interview until Palmer asks if she believes in God. Her answer is that there is no evidence establishing a deity, and the panel decides that if ninety-five per cent of the world believes in a supreme being then she is not a good representative to be an emissary to an alien civilization. Of course, Drumlin says that he believes in God, and he is chosen. When Palmer later visits her in her hotel room, she says that she was honest and Drumlin told the panel exactly what they wanted to hear. Palmer says that he couldn’t choose in good conscience someone who thought the vast majority of the world suffered from some kind of mass delusion. Ellie then returns the compass to Palmer, indicating that they are traveling in different directions. 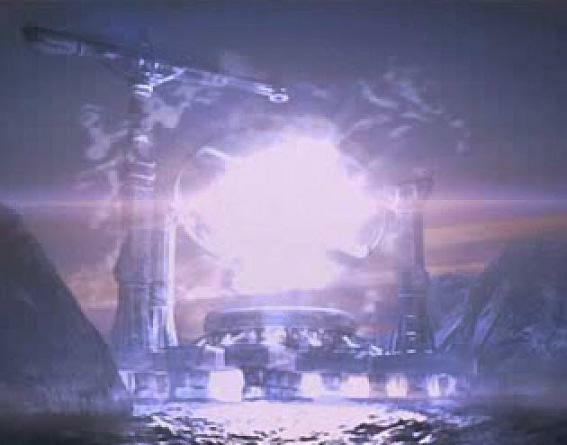 Palmer shows up at the ship that acts as the control center for the machine. He tells Ellie that the real reason he voted against her was because he didn’t want to lose her. He now is there to support her, and gives the compass back to Ellie, showing how they are on the same path again. It is significant that Ellie, the person of science, argues against having a secured chair with a harness installed in the pod in which she will travel, because no such construct was mentioned in the schematics. 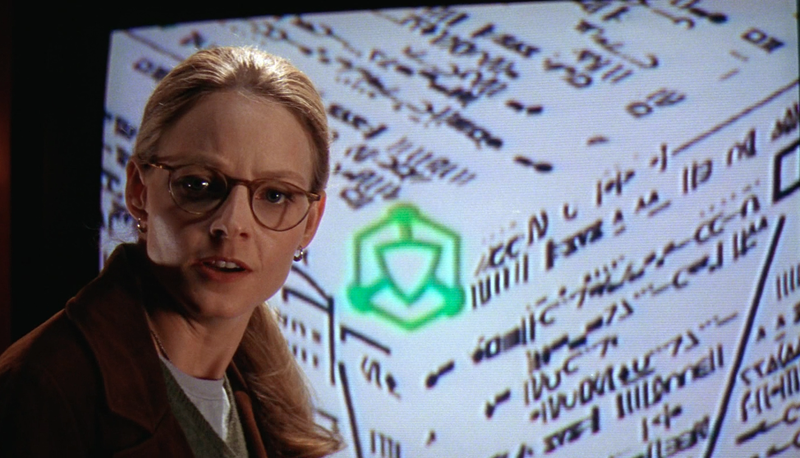 She is placing trust, in a sense faith, without actual proof, that the aliens have provided safe instructions. The pod drops through these revolving power loops and she travels through a wormhole to Vega and beyond. She sees celestial events that move her emotionally, not scientifically, leaving her speechless. The compass she wears comes loose, and she detaches herself from her chair harness. She safely floats after the compass while the chair violently breaks away from its bolts and crashes into the ceiling of the pod. Her faith in the aliens was justified. And, in a kind of twist, the compass, which she jokingly told Palmer to hang onto because it might save his life, actually does saves her, again validating her journey. When she arrives at the destination, she passes out. We again have a camera focusing in on her eyes, which shows her connection to the universe as a whole. She is transported down into an artificial construct that resembles Pensacola, Florida. But, the scenery is stylized, more vibrant in color than normal, yet with no sun out, and the waves moving backward. Also, when Ellie, after waking up, touches the air around her, it distorts the scenery, showing that the environment is a version of reality, sort of like a movie. She sees some wavering lines approaching her on the beach which coalesce into the form of her deceased father. She realizes that he is not really there. The aliens have downloaded her thoughts and memories to make it easier for her to relate to where she is. But, in a way, she has finally broken the bounds of her early communications exploration, and successfully made contact with her dead father, who lives on in her mind. The alien, however, provides no absolute answers. The machine that transported her was built eons ago by a race that was long gone before the current inhabitants used it. In a way, to search for ultimate answers is a fruitless act, there always being more questions to ask. He does say that there are many other civilizations out there, and many took the same journey to make contact that she did. So, humans are part of a much larger universal community. The alien makes an assessment of humans, which sums up the primary theme of the story. He says to Ellie, “You are an interesting species. An interesting mix. You’re capable of such beautiful dreams, and such horrible nightmares. You feel so lost, so cut off, so alone, only you’re not. See, in all our searching, the only thing we found that makes the emptiness bearable, is each other.” Intelligent beings are driven to seek a connection to something larger, even if they go about reaching this goal in different ways, as do Ellie and Palmer. Ellie wants to ask tons of questions, but the alien says that she must return home now. He is a bit mired in an almost bureaucratic tradition when he says that this is the way contact has been made for billions of years. But, it is possible that humans are not quite evolved enough to receive the answers yet to all of the questions Ellie would like to ask. Her species has taken the first step, and in time there will be others. He sounds like Ellie’s father when he says she must take, “small moves.” He says there are no tests here, but that is not entirely accurate. 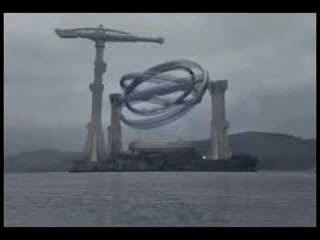 She returns back to the pod which drops through the energy hoops, into a safety net close to the ocean. Forty-three cameras show that the pod dropped straight through the hoops. Her recording device showed only static. So, she has no proof of her trip, and the evidence indicates that she went nowhere. The ‘test” is believing in what happened, convincing herself, and others, that her story is true. 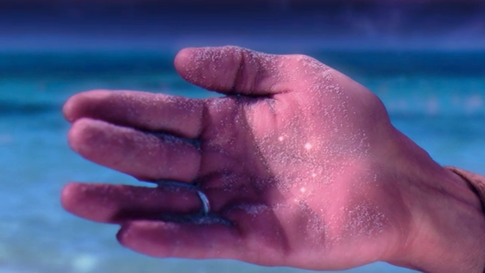 IMDb point out that there is a repetition of a star pattern in several places in the movie: in the popcorn on the floor where Ellie’s father dies; the quadruple shining star system Ellie witnesses in the pod; in the few sparkles of sand in the Alien’s hand on the artificial beach; and again at the end of the film, as Ellie imitates the alien by picking up some partial glistening gravel near the rim of the Grand Canyon. This configuration seems to point to Ellie’s words at the inquiry about “how tiny and insignificant and how rare, and precious we all are.” Individually, we may seem minuscule, but together, we approach infinity. The next film is Friday Night Lights.